Seniors -- If you haven't taken your Civics Exam yet - be studying. Mrs. Amber is going to be scheduling the rest of the seniors to take it within the next couple of weeks. 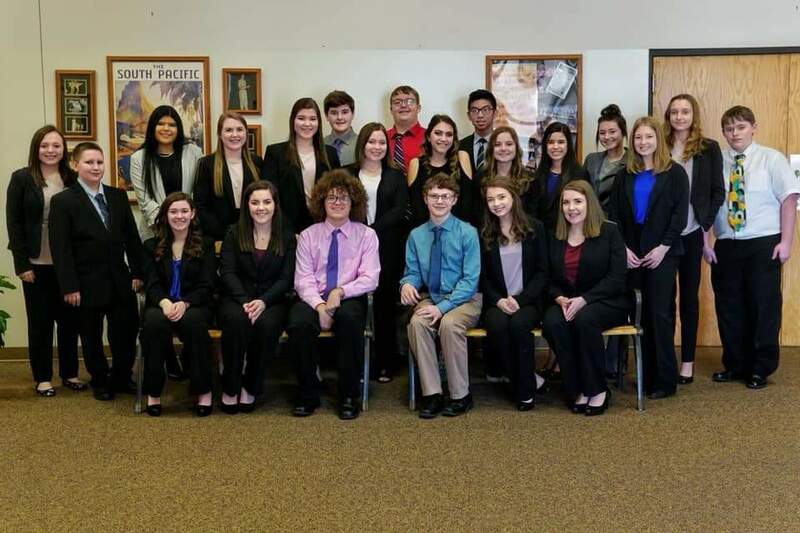 ML FBLA members who are attending the Spring Competition Conference on February 6, don't forget to turn in your permission slips by Tuesday. Monday- Greenhand/Chapter Degree Day- *FFA members will meet in the new gym during Activity Period. Tuesday- T-Shirt/Hat Day- *FFA members that wear FFA T-shirts or Hats will have a chance for the $20 giveaway. Wednesday- Faculty/Staff Pancake Appreciation Breakfast - *Breakfast for the Faculty/Staff will be served at 7:40 in the AG Shop. Everyone is invited!! Thursday- Read to Preschool Day- *Members invited to read small books to preschool children during Activity Period. Tuesday -There will be a meeting in the old gym for all boys and girls grades 7-12 who would like to participate in track this year. Tuesday - There will be a Senior Class meeting in the cafeteria during activity period. Wednesday - There will be a Drama Club meeting in the ??. Wednesday - Retake the Tennis Picture during activity period in New Gym. Thursday - There will be a FCCLA meeting in Mrs. Little's room. Friday - There will be a FCM meeting in Mrs. Conley's classroom #214. The following students need to come to the FCS room during activity period today:Logan Allman, Austin Crawford, Bradley Hoggard, Megan Marcus, Braden Ralph, Corbin Reagan, Dominic Reagan, Jordan Simpson, Homer Warbritton and Daniel Stockdill. Juniors: If you would like to sign up for a Prom committee, please sign the sheet on the library windows. Teachers: Don't forget to send home AMI packets for at least Day 2 and Day 3. Monday night, Girls Basketball will have a black-out game vs. Corning beginning at 5:00. Tuesday night, Boys Basketball will travel to Corning. SENIORS: The Arkansas School Plant Management Association scholarship application is for any graduating senior planning to attend a college/university, vocational-technical or trade school who has at least a 3.0 GPA and at least a 19 on the ACT. You must complete the application, essay, and 2 recommendation letters. See Mrs. Amber, Mrs. Conley, or Ms. Rachel for more information. SENIORS: https://nspma.org/wp-content/u...The National School Plant Management Association (NSPMA) seeks to assist qualified students who are continuing their education by offering scholarships to those pursuing an Associates or Bachelor degree. Any graduating high school senior, college freshman, sophomore, or junior is eligible to apply for a scholarship. The total number of scholarship awards is based on the NSPMA Scholarship Trust Funds, and awards are based on the selection criteria (financial need, academic achievement, co-curricular participation, community service, and essay response). Individual scholarships may range from $500 up to $1,500 depending on the candidate’s interest, evaluation results, and recommendation from the NSPMA Scholarship Committee. The application receipt deadline is February 1, 2019. For additional information, please contact Mike Mertens.